2016 is here already, how time flies. With the holidays over, visitations of friends and families over, the cooking schedule back to normal, the decorations packed away, and awaiting the credit card bills, Oh what fun we had. We now look to get back to our Grange work and plan for the upcoming year’s events. Northeast Leader’s Conference is January 15-17 in Milford, MA. We will be sharing ideas and planning for the 2018 National Convention, somewhere in New England? Hopefully we will have some answer so we can start fundraising to help pay for it. • Do we still need Pomona Granges? • How do we attract Fourth Degree members to attend Pomona Granges? • How do we divide a Pomona Grange after they close? • What should the State Grange do to support the Pomona Granges? • Should we close our Pomona Granges altogether? These are some of the points I have heard throughout the state and from concerned members. Brother James Tetreault, Past Lecturer of the National Grange, will be moderator for this event, so come out and speak honestly, civil and open-minded so maybe this Pomona problem can be settled for once. Please join us. This year we are still challenging our Community Granges to increase membership. 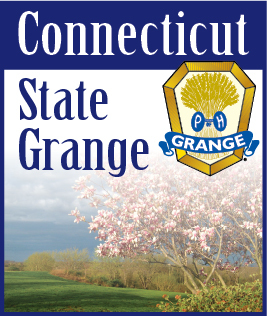 Our State Membership Committee is willing and able to supply your Grange with kits for a membership display. Get in touch with anyone on this committee for assistance in getting the Grange message out to the public. The 2016 National Grange Convention will be in Washington, D.C. in November. The Board of Directors is looking into getting a bus to bring Connecticut Grangers to Washington for the Night Tours, Evening of Excellence, and the Seventh Degree. If you have any ideas for fundraising this project, please contact a board member. They seem to have exciting activities planned for the 150th celebration. Don’t miss out. With the winter weather the Farmer’s Almanac has predicted for us, I am to remind all that Community Granges must hold one meeting per month. But DO NOT risk members to hazardous conditions. Be safe and play it safe. You all are too valuable to lose to crashes or falls. It is now time to reflect on the past year as to our strong points or how to change our weak points. Teamwork is the only way to move forward. One member cannot do it all and shouldn’t be allowed to take on that burden alone. Leaders delegate and let them work with clear objectives, materials to do the job, praise if they succeed, or encouragement if they stumble, and help if they ask for it. Leaders should work to train their replacements, not keep them down. This year the 2016 elections are going wild. The language and action of those running for our President are not the American Values of the Grange. They must take a lesson from our Grange Motto “In essentials, unity; in non-essentials, liberty; in all things charity.” These values can make our country great and our people strong. With the actions of some of the candidates I would doubt they would be balloted into membership in our Granges. So let’s be above the hatred and mudslinging and be good Grangers.